I have been away from this blog and out of the hives for a couple weeks. A little too much travel and jet lag and other distractions. Trying to catch up this weekend, starting with the status of the new queen for Venus. My prior post on Venus described how Venus appeared to be without a queen, and how a new Russian queen from nearby breeder Chris Hewitt was caged and ready to be released in the hive. I looked in the observation window this week and was surprised at how few bees appeared in the window. They had a new queen, why isn’t the population growing? Well, duh. The eggs have to be laid, the larvae grow, and the pupae capped before new bees arrive. It takes 21 days to make a new worker bee; roughly 3 days as an egg, 5 as a larva, and 13 days as a capped pupa before emerging as a worker bee. As with so many other aspects of beekeeping, patience is required. Venus’ new queen (with the white dot) on June 4. The color white indicates she mated in 2016. 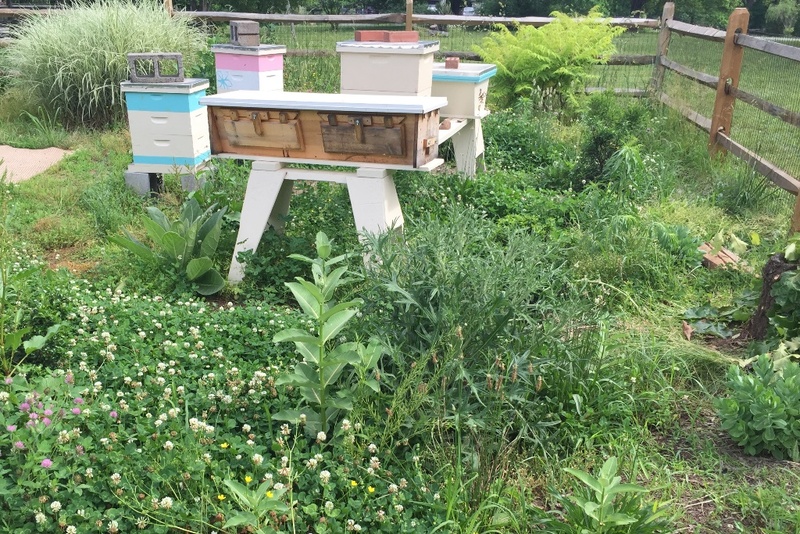 When I saw the queen in this picture she was walking stately among the bees. The couple frames I looked at did not have any brood that I could find, so I presume she was somewhat freshly released. As a result, new workers will start appearing around June 25; another week to go. I didn’t bother the poor girls today, hopefully they are hanging on and caring for their new queen until the new workers emerge. Next weekend I hope to take a look. This 1992 book by relationship counselor John Gray argues that men and women have fundamental psychological differences. Mars, as you may know, is the god of war; and Venus the god of love. So you can begin to see how this might cause some issues for male and female couples. I have not read the book, though it remains in print and highly rated on Amazon as of this posting, roughly 24 years after the original publication. For our title, the new queen is in Venus, of course. 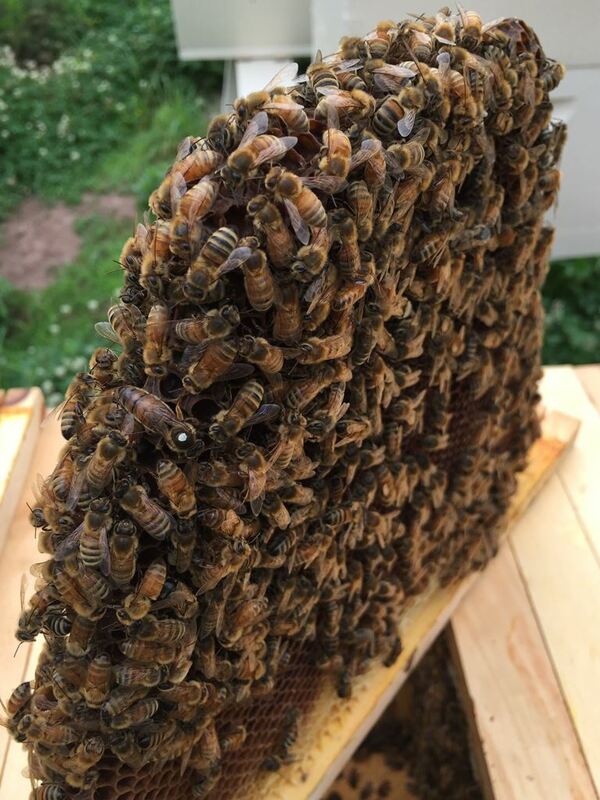 Given that the breeder, Chris Hewitt, has bees within two miles of my home, my new queen could well have mated with drones from Mars. Yet another amazingly appropriate title from the beeswitheeb blog. Did you spot eggs, or was the comb too dark to see? Not when I took this picture. I’ve never been able to see / find the eggs, a combination of lack of experience and older eyes, I am sure. That was true until yesterday, when I just noticed some on a frame in another hive. Plan to make it my next post…. Perhaps you are getting your eye in 🙂 A magnifying glass can be useful, I keep one in my bee kit. Also new comb and holding the frames up to the sun. Noticed your comment about not being able to see eggs. One thing you might try is taking photos & then blowing them up later. I’ve tried that to no avail. Finally succeeded however. Have a new post for later tonight.